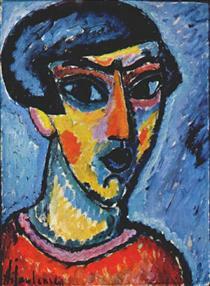 Alexej von Jawlensky was born in Torzhok, a town in Tver Governorate, Russia, as the fifth child of Georgi von Jawlensky and his wife Alexandra (née Medwedewa). 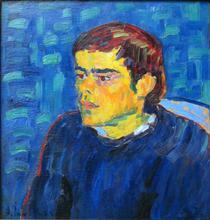 At the age of ten he moved with his family to Moscow. 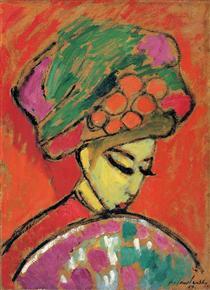 After a few years of military training, he became interested in painting, visiting the Moscow World Exposition c. 1880. Thanks to his good social connections, he managed to get himself posted to St. Petersburg and, from 1889 to 1896, studied at the art academy there, while also discharging his military duties. 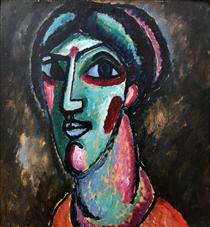 Jawlensky gained admittance to the circle of Ilya Repin, where he met Marianne von Werefkin, one of Repin's former students and a wealthy artist four years Jawlensly's senior who gave up her career to promote his work and provide him with a comfortable lifestyle. 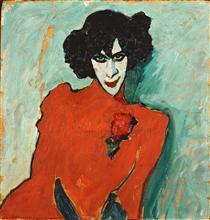 Free to pursue his artistic vision, he moved to Munich in 1894, where he studied in the private school of Anton Ažbe. 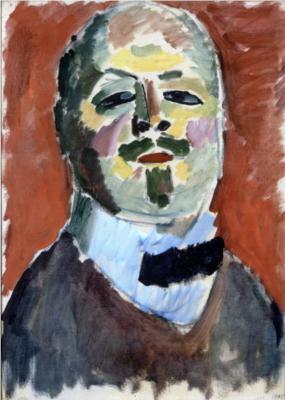 In 1905 Jawlensky visited Ferdinand Hodler, and two years later he began his long friendship with Jan Verkade and met Paul Sérusier. 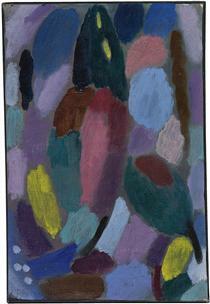 Together, Verkade and Sérusier transmitted to Jawlensky both practical and theoretical elements of the work of the Nabis, and Synthetist principles of art. 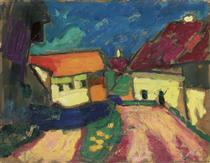 In Munich he met Wassily Kandinsky and various other Russian artists, and he contributed to the formation of the Neue Künstlervereinigung München. His work in this period was lush and richly coloured, but later moved towards abstraction and a simplified, formulaic style. 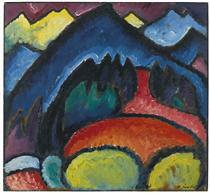 Between 1908 and 1910 Jawlensky and Werefkin spent summers in the Bavarian Alps with Kandinsky and his companion, the painter Gabriele Münter. 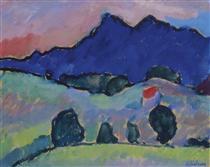 Here, through painting landscapes of their mountainous surroundings, they experimented with one another’s techniques and discussed the theoretical bases of their art. 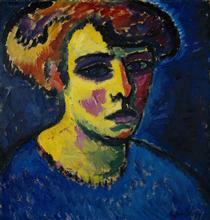 Following a trip to the Baltic coast, and renewed contact with Henri Matisse in 1911 and Emil Nolde in 1912, Jawlensky turned increasingly to the expressive use of colour and form alone in his portraits. 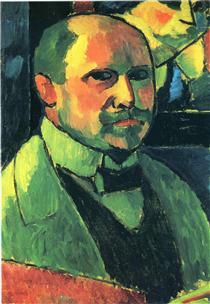 Expelled from Germany in 1914, he moved to Switzerland. 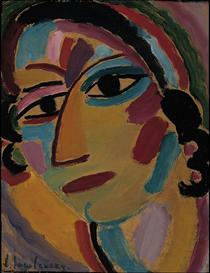 He met Emmy Scheyer in 1916 (Jawlensky gave her the affectionate nickname, Galka, a Russian word for jackdaw), another artist who abandoned her own work to champion his in the United States. 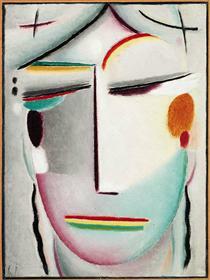 After a hiatus in experimentation with the human form, Jawlensky produced perhaps his best-known series, the Mystical Heads (1917–19), and the Saviour’s Faces (1918–20), which are reminiscent of the traditional Russian Orthodox icons of his childhood. 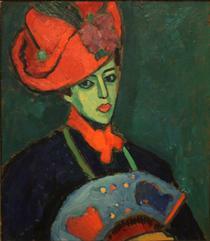 In 1922, after marrying Werefkin’s former maid Hélène Nesnakomoff, the mother of his only son, Andreas, born before their marriage, Jawlensky took up residence in Wiesbaden. 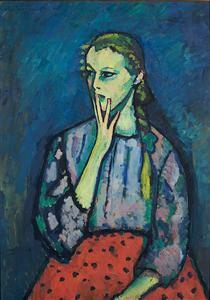 In 1924 he organized the Blue Four, whose works, thanks to Scheyer’s tireless promotion, were jointly exhibited in Germany and the USA. 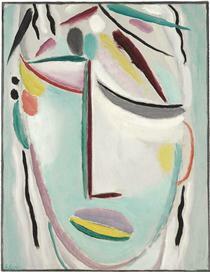 From 1929 Jawlensky suffered from progressively crippling arthritis, which necessitated a reduced scale and finally forced a cessation in his painting in 1937. He began to dictate his memoirs in 1938. He died in Wiesbaden, Germany, on 15 March 1941. He and his wife Helene are buried in the cemetery of St. Elizabeth's Church, Wiesbaden.